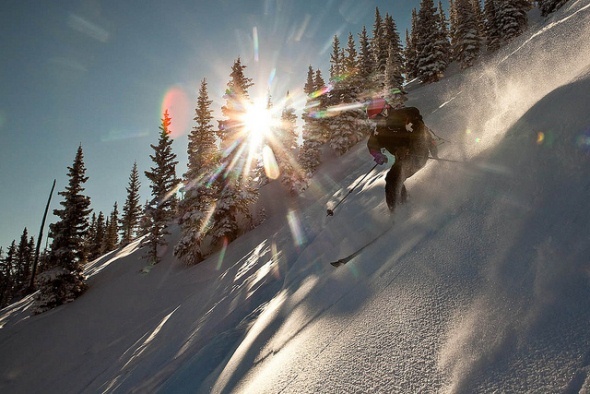 Snowmass is the largest of the Aspen ski areas, with a 4,406-foot vertical drop that’s No. 1 in the United States and 3,132 acres of skiable terrain that’s No. 2 in the United States. Snowmass has long been rated one of the nation’s top ski areas for families, with its wide-open, well-groomed trails, but it has added three terrain parks in recent years to serve the younger snowboarding and acrobatic skiing crowd. That vertical drop comes from a summit that reaches 12,510 feet at The Cirque from a base of 8,104 feet. Snowmass has four distinct areas, known as Elk Camp, High Alpine, Big Burn and Sam’s Knob, with gondolas serving Elk Camp and Sam’s Knob. Snowmass has 91 trails covering 147 miles on the 3,132 acres of terrain. The steepest runs, both off The Cirque, are Gowdy’s and AMF, with cliffs, rockbands, and a pitch of 40 degrees. Snowmass also has a back bowl called Campground with long double-black runs and variable terrain. In addition to the two large gondolas, Snowmass has 12 chairlifts, two platter pulls, two secondary lifts, four lifts reserved for the ski and snowboard school, and a short gondola that runs from the longtime village to a base in the midst of a $2 billion new development on 80 acres. The lifts serve 33,058 riders per hour. Snowmass classifies 32 percent of its runs as expert, 12 percent as most difficult, 50 percent as more difficult and 6 percent as easy. It has opened three terrain parks, Snowmass Park, Makaha, and Low Down, with an 18-foot superpipe at Snowmass Park and 1 12-foot beginner pipe at Low Down Park. The ski area averages 300 inches of snow, with a ski season that begins at Thanksgiving and runs into mid-April. It has snowmaking capability on 230 acres. Snowmass has eight restaurants scattered across the mountains. Sam’s Smokehouse sits atop Sam’s Knob with panoramic views of Garrett’s Peak and Mount Daly, and Up 4 Pizza rests at 11,820 feet at the top of Big Burn.